I have to confess that I have never been a big fan of Brussels sprouts so I was a little intimidated when I saw a box of them from the Avonmore Berry Farm stall at the Ottawa Farmers’ Market in my Farmers’ Feast Challenge basket. Despite a lifelong love of other cruciferous vegetables, especially broccoli, cabbage and bok choy, I have consistently avoided these little green orbs. I suspect it was the bitter, sulphurous odour they give off (not to mention the corresponding taste) when they are overcooked. At any rate, I will be ignoring these humble sprouts no more. Packed with nutrition, they are also exceptionally delicious when prepared with a little care. This pretty salad is a winner. 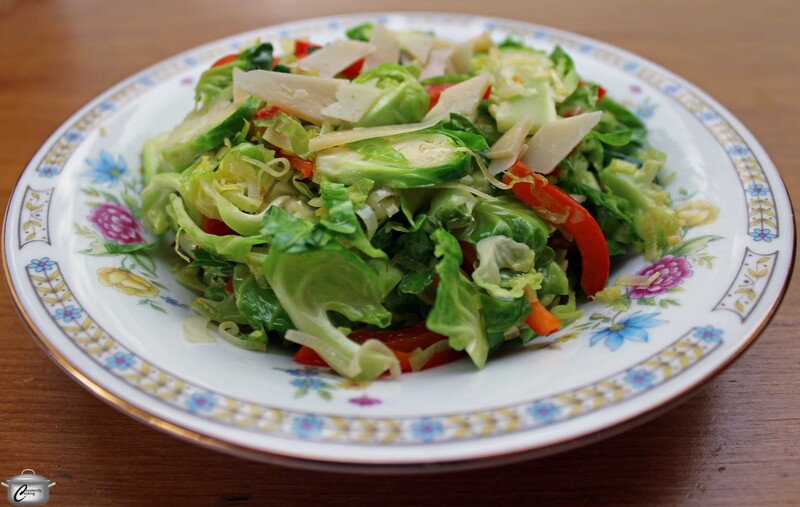 After a lifetime of avoiding Brussels sprouts, I am now a big fan of them, thanks to this tasty salad recipe which features, leeks, red peppers, a delicious vinaigrette and a topping of Parmesan. Trim the stem ends of the Brussels sprouts then slice them thinly (1/4 inch / .3 cm or less) from top to bottom. You should get about 2 1/2 cups (625 mL) of sliced Brussels sprouts. In a small jar with a tight fitting lid, combine thyme leaves, olive oil, maple syrup, cider vinegar and Dijon. Cover and shake until well blended. Set aside. In a large, shallow pan (use a wok if you have one), heat oil over medium-high heat. Add sliced leeks and red peppers. Sauté for 4 – 5 minutes, stirring often, until tender. Add sliced Brussels sprouts and salt to the pan and cook for 3 – 4 minutes, stirring often, until the sprouts are turning bright green and the thickest slices are just barely tender. Don’t overcook the sprouts as this will give them a bitter taste. Transfer the cooked vegetables to a serving bowl. Drizzle with dressing and toss. Sprinkle with parmesan and serve. This entry was posted in Salads, Vegetables and tagged apple cider, Brussels sprouts, cruciferous vegetables, dijon, leeks, maple syrup, olive oil, parmesan, red pepper, salad, sea salt, thyme, warm. Bookmark the permalink.